Bulk solid storage silos has several equipment attached to them to function properly. Product level in the silo is monitored. Silo filter is used for dust collection. 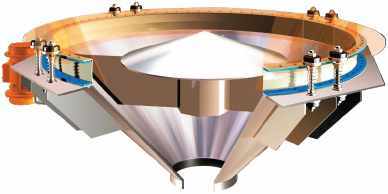 Pressure sensors, pressure relief valves work for silo safety. Discharge aid equipments work for durable product flow. Valves and feeders control the silo discharge. Silo jet filters are used to prevent any dust emmission from silo. 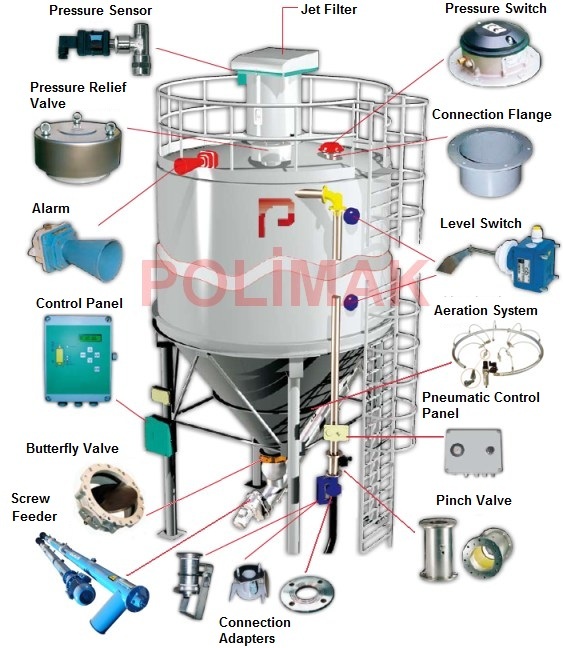 During pneumatic conveying of bulk solids to the silo, there exists air and dust within silo. Jet filter is used to discharge the air and filter the dust. Cement, ash, food, plastics, minerals are generally loaded to silos by pneumatic conveying systems of bulk trucks. Silo filters are used to vent these silos without dust emmission. Silo pressure relief valve is used to prevent any high pressure generation within the silo. During filling of the silo with pneumatic conveying, there may be risk of pressure increase within the silo. Pressure relief valve vents the silo if the pressure level rises above the determined level and maintains low pressure. Silo pressure relief valves are one of the important safety devices used in bulk solid storage silos. To fluidize the bulk solid within the silo, aeration pads are used. The fluidized material will flow easily and silo discharging will be better. Aeration pads / air jets are placed near the discharge outlet flange of the silo. 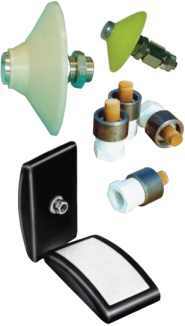 Pressurized air is applied to air jets and makes the bulk solid flow better. 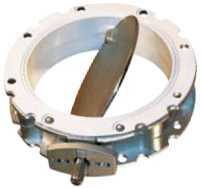 Butterfly valves are used to control the discharge of bulk solids from silos. 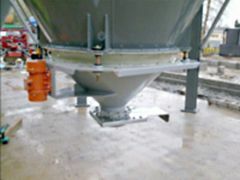 Screw conveyors are widely used below the silos to control the flow of bulk solids. The rotary valve placed under the silo, is used to control the bulk solid (in powder or granule form) discharge from these units and feed equipments like conveyor, screw feeder, mixer etc. Bin activators are also know as vibrating bin dischargers. They generate a vibration below the silo to fluidize the bulk solid in the silo, make it flow downwards and discharge easier. Bin activators are very helpfull for bulk solids that flow hard. 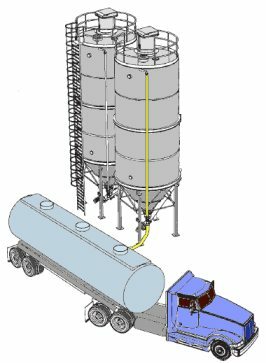 Silo control systems are used in silos where bulk trucks load the silos by pneumatic conveying system. They check the level of product in the silo, inner pressure of silo, they control the jet filter, inlet and discharge valves for safety and reliability.